Tom knew he would be OK sitting there for at least 3 weeks. "How dare you throw away perfectly good lasagna, Jon!" Like all coronation street extras you eventually end up on the scrap heap. 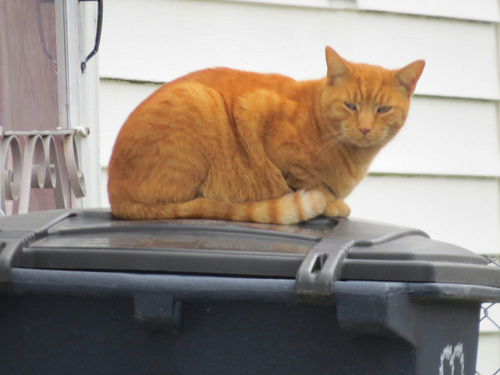 Cheshire Cat's bin mischievous again - where could Alice be? He couldn’t play with the other cats, because they all bullied him calling him a Ginger Minger. You want to use my bin? We need to talk. Ginger discovers meals on wheels. -"Open the bin please, Marmalade." "Just sitting here ,watching the street." "No, where've you wheely bin Tom." "Just sitting here watching the street for Christ's sake." "Darling, when I asked you to feed the cat and take the rubbish out, why is there a bowl of whiskers next to the bin in the kitchen?" I also thought Cats was rubbish. Ginger was confused. The sign said "Put Litter in Bin"
George the cat was having trouble trying to swallow next doors missing snake. On a bin outside an STI clinic, Tom can definitely smell lots of white mice in here. "Let's just see you try to get those chicken bones past me."